Yea I only work around 3-5 hrs a day maybe longer on weekends. I am leaning toward this one based on cost. Teco, leeson, fuji, siemens, AB, .... are industrial grade VFDs, designed to run 24/7 for years before replacement. They are programmable with a keyboard. You can shop and find them for less than KB. My grinder VFD is located above, to the left and behind the grinder, so it sees very little grinder dust. If you are only running the grinder, a single two-position ON/OFF switch is all you need. It will go on the door in the Start / Stop location. But if you have plans to run your grinder in Reverse then you’ll also want a three-position switch for FORWARD / STOP / REVERSE. I use my VFD to run both my belt grinder amd my disc grinder. My KMG never runs in reverse but I run my disc in opposing directions all the time. Scott , do I have to program the vfd? What are the program options i just assumed it was turn it on and twist the knob ? An industrial VFD gives you a wide array of things you can control. A KBAC is stupid simple which is great for running a grinder, but it would be fairly useless in an industrial automation application which is what 99.999% of VFDs are designed for. The programming you need to do on an industrial VFD is very simple and done from the keypad on the VFD itself. You would basically leave everything at the factory default. You would want to set a couple of parameters such as maximum RPM for the motor you're using and you'd set it to "coast to stop" when you hit the stop button rather than an immediate stop. This would be set under the DECEL or RAMP parameter. (you control how long it decelerates to zero speed). It's not complicated. There are a ton of options, lalmost none of which are applicable to your needs so you would just leave them alone. So if I mount it somewhere up above the grinder and off to the side it should be fine with just an A/C filter to keep the dust out. yes an a/c filter should be ok. i also vacuum mine whenever I vacuum around the grinder, say once a week or so. Yes, it is very simple. It's about as hard as setting the temperature and timer on the digital controls for your kitchen oven. Same concept. You enter a menu and then scroll up/down until you get the setting you want. Easy peasy. If you go the industrial VFD route there are plenty of people here who can help you out. 3. A speed reference. The VFD is a speed controller, so it makes sense that once you tell it to RUN it says, "OKAY>>>HOW FAST? This is where a potentiometer is super duper handy. The KBAC puts a speed knob right on the front door. Most every industrial VFD has a place on the terminal strip to connect a speed knob. It will be called the "external speed control" or "analog input" in the manual or on the wiring diagram. The KBAC is no different, it just comes wired up already. Two screws, one for each wire from the speed control knob. Super simple. If you don't have a knob, then you can also use the keypad to increase or decrease speed. This is a gigantic PITA. You want a knob. The great thing is you can have the VFD over on the wall somewhere and just have a little box at the grinder with the knob and START/STOP switch on it where you can reach it. There's no need to mount the VFD near the grinder unless you want to. That's basically it from a control standpoint. I run my 2X72 in reverse a good bit - especially when sharpening on it. Also reverse when using the flat platen for lengthwise grinding. 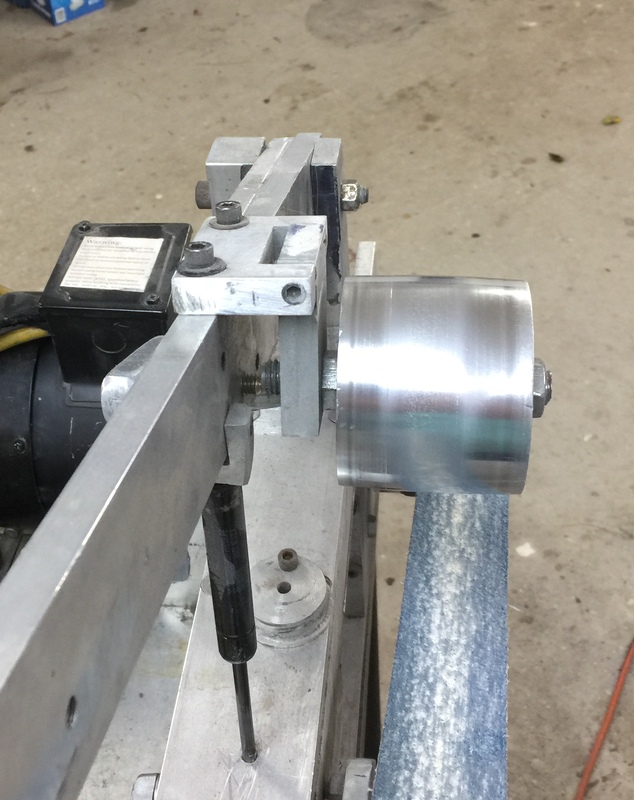 Nathan shows it here with a curved platen for working hollow ground blades. I use a standard flat platen (with rounded end) for lengthwise grinding. I wanted to do that so bad. I have watched a bunch of sharpening videos where the guy runs it in reverse. I can't get my KMG to track well enough in reverse. Here's the tracking adjustment I use - by twisting the top bracket left/right I can find a spot where the belts run forward and reverse. OOops, sorry the photo is so large - I should have reduced the size some. That’s pretty genius there, Ken! That top bracket allows the alignment correction I need. Head slap moment! I am currently using a Leeson speedmaster for my grinder. It has dedicated push buttons for on/off, start/stop, speed increase and speed decrease. I have the stuff to do remote switches, but when standing the VFD is within easy reach so i just use the factory buttons. Does all VFD not have pushbuttons on the panel for OFF/ON/REVERSE? All I have used do, especially the Chinese VFDs. Sometimes they're not as convenient to use as remote hardware switches. I use VFD panel switch on 1 of the VFDs, and have remove switches on the other two. The KB’s don’t. It’s easy enough to add, but they don’t come with it. They actually use toggle switches. Thanks again for all the info guys. I now have to decide which to get and what options I want. It will be a few months before I actually tackle this as I ned to get the Christmas orders I have done before I shut down equipment lol. I assume the VFD supply places sell the speed knobs correct? I assume the VFD supply places sell the speed knobs correct? background it’s easier to buy from the VFD suppliers. I think this is the VFD and motor I'm gonna go with hard to beat the price.